You can become a confessor like the saints. Confessors are the “guides of our souls”. Before you can become inspired to be a confessor like the saints, there needs to be a deep understanding of the marvel and magnificence of the confessor which is something that can be lost in the daily hustle and bustle of the priesthood. Through the merit of Christ’s death and resurrection, the confessor is God’s gift of salvation to the people. Without absolution (forgiveness) from all mortal sins committed after baptism surely souls would perish into the eternal fire if it were not for the power which Christ breathed onto His chosen priests that comes forth from their blessed hands. (cf. John 20: 22-23) Confession is the sole ordinary means to save a soul that has broken its relationship with God and His Church (Can. 960). The above quote from Jesus in St. Faustina’s Diary should really enlighten everyone to the absolute importance of confession. Where does the greatest miracle take place? Not even the Holy Eucharist can bring someone back to life by restoring within them sanctifying grace after it was lost since baptism. Only Christ, working through the confessor, in the sacrament of reconciliation can do that. God can also work through the priest in the sacrament of the anointing of the sick to purify souls but only of their venial sins. * A soul that is dead is brought back to life through the sacrament of reconciliation. The power coming through the priest hands, in confession, is the only ordinary means a soul is reunited with God and the Church. 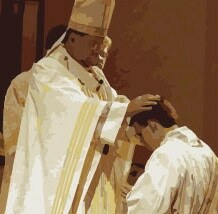 The priest is a gift, another great act of mercy, sent to us from God, to save our souls. Now, not only are we saved through baptism, but everyone outside of perfect contrition, who has sinned mortally, is saved too by God working through the hands of His miraculous confessor. Almost as important, is the priests responsibility for guiding each and every soul who enters the confessional toward Our Lord and away from sin so they can learn to “sin no more” and stay on the narrow road to salvation. What an incredible responsibility and privilege! A deep sense of humility must be present in the confessor so he can continue to pursue greater paths of holiness and ways in which he can improve being a light for the people. There must be constant change since there is never ending growth potential. Great temptations exist for some priests, especially with much education and/or gifts from God, to feel there is nothing more they can learn, that they have already acquired everything there is to know about confession which leaves them blind to the countless lessons and enlightenment God has in-store for them. God wishes for each confessor to save souls like the saints and below you will find some inspiration to do so. Go to your confessor; open your heart to him; display to him all the recess of your soul; take the advice that he will give you with the utmost humility and simplicity. For God, who has an infinite love for obedience, frequently renders profitable the counsels we take from others, but especially from those who are the guides of our souls. Sadly, confession is sometimes thought of, and practiced as, nothing more than the penitent generically listing their sins, and then being granted forgiveness. That is confession in its most basic form which is, of course, valid if nothing else is available, but it isn’t the fullness of the sacrament. When confession is restricted in such a manner, many blessings and graces from the sacrament are lost. This is not how the saints throughout the history of the Church to the present age have viewed confession. Saint Faustina goes so far as to describe this type of confession as damaging to the soul, (click to learn why). The saints from Saint Alphonsus, patron saint of confessors, to Saint Pope John Paul II, define confession as MUCH MORE than that. Sadly, somewhere, through the years, the true meaning of confession has been lost for some. By reading the above quote from Saint Francis de Sales, we can easily see how the penitent is called to open their hearts to their confessor and go into depth about their sins with humility, and take the godly advice given to them to help eradicate sin from their life. Saint Pope John Paul II, as well as Saint Padre Pio and many others, would spend countless hours hearing confessions in order to help guide souls away from sin, since it is sin that keeps a soul from God, salvation and a life of joy. Any practice which restricts confession to a generic accusation of sin or of only one or two sins judged to be more important is to be reproved [stopped]. Every ordained priest has the gift of guiding souls away from sin to restore them into union with the Lord, and to help them grow and transform their lives into holiness. This is done not only through spiritual direction, but also through the Spirit driven words in the confessional. Be an amazing confessor! Below you will read techniques you can use to guide souls away from sin like the saints. Being a confessor can and should be one of the high points of being a priest, as a great confession can truly be life-changing for the penitent. This is how souls are saved, and what an amazing role a confessor has! There is nothing more disappointing for a penitent than to enter the confessional looking for help and not receiving any. Being full of fear and pouring out one’s sins, only to be told, “I would like you to pray three Hail Mary’s—your sins have been forgiven” is such a turn-off for many penitents. The penitent may choose to not confess to that particular priest again, or far worse, abandon the sacrament altogether because they feel cheated or unloved, and then they might tell others what a disheartening experience it was diminishing the grandeur of the sacrament.This is not how confession should go—no one should ever leave the confessional feeling anything short of being fully immersed in God’s love, light and mercy. Sometimes for penitents, who are striving for sanctity, who have been given great self-knowledge, they are directed away from frequenting the sacrament being accused of having a scrupulous heart, when the penitent is simply desiring to grow into holiness and purity from the grace Our Lord delivers through confession. It is in grave error to suggest that confession is only for mortal sins, or it must be only sought occasionally when the possibility of grave sin might be present. If the saints, who most likely had perfect contrition and probably possessed what we would consider venial sins, frequented confession (weekly or even daily, when possible) there must be more to the sacrament than some might understand as the saints have proven it simply isn’t only for what we consider to be mortal sins. …clergy who make light of, who lessen esteem for frequent confession realize that what they are doing is alien, alien to the spirit of Christ and disastrous to the Mystical Body of Christ. pray for the Holy Spirit’s guidance and for each penitent’s soul. guide each soul towards God and away from any mortal sin or sin in general. Lord, please send us laborers for the harvest. Not all priests are comfortable in the confessional, nor do they feel they always do an adequate job directing souls away from sin. Thus, they may shy away from hearing confessions or say nothing to the penitents in the form of guidance, and only give them a basic penance. Yes, directing someone improperly in confession is a great offense to God and is both harmful to the priest and penitent’s soul and should be taken very seriously. To adequately guide souls, a confessor needs to be well versed in matters of Moral Theology and willing to labor for the salvation of souls. And of course it is true that the main purpose of confession is the forgiveness of sins, through the priest acting In persona Christi (in the person of Christ), and sins will be forgiven whether the priest says any words of guidance or not; however, a priest can do, and is called to do so much more to help penitents avoid future sins by giving them life-changing words of guidance. The following will give you simple yet effective techniques you can use to effectively guide the penitent out of the darkness and into the light. The directing of souls [in confession] is the art of arts. Unfortunately, many approach the confessional blinded to their sins. They say, “I don’t sin.” The apostle John declared that this statement is derived from darkness due to sin. “If we say that we have not sinned, we make him a liar, and his word is not in us” (1 John 1:10). Some believe they only need to go to confession for their “current sins.” They operate under the misguided notion that since they haven’t recently committed any big sins—even though they haven’t been to confession in years—that it’s all good and they don’t need the sacrament. Then there are those who confess the same sins over and over again, without ever changing their ways, due to a lack of effort to modify their life to avoid repeating their sins which all stems from a lack of love for God. When our love is complete our desire for true repentance (hate of one’s sins) is complete too. Growing close to God is hard work; it takes effort. If people wish to sin no more and live a joyful life—a life without hurting Our Lord through their transgressions—they will need to take action to know their sins by examining their conscience properly and avoid them, as opposed to brushing it all off with the excuse, “Oh well, this is just how I am.” The priest can help them to see the error of their ways and guide them on the path to salvation. This is the challenge. God calls us to be perfect as our heavenly Father is perfect for a reason—so we can grow in holiness. Holiness is for everyone. However, it is our sins that prevent us from doing so. God made us all beautiful, in His likeness, therefore we need to peel off the ugliness of our sins and let God’s amazing beauty radiate from within us. If sinners would only approach the confessional with true sorrow and the desire to change, then God would flood their souls with grace after grace to help them live good, holy, joyful lives. “Sin increased [because of the increased knowledge after the Law], grace overflowed all the more [from God’s generous heart desiring our salvation]” (Romans5:20). To Him [confessor] we must fully open our hearts. If we do so, he will be able to tell us what the Lord wishes of us. Once we have chosen a confessor, we must go to him steadily, because unless he knows us thoroughly, he cannot advise us on our vocation…Keep in mind that the chief judge of your vocation is your confessor. If penitents aren’t open to God’s grace, which pours forth through the priest’s consecrated hands in the sacrament of confession, then God can use the words of the priest to ignite a passion for change within them. Words inspired by the Holy Spirit—and spoken by the confessor to the repentant souls—can be very powerful. They might be the means by which God wishes to transform certain souls from being complacent into taking action for their salvation. What kind of salvation are people looking for? Do they only desire to just squeak by into purgatory—which the saints describe as a place with long years of incredible anguish, suffering, and punishment from their lackluster faith? Actually, lukewarm souls sadly don’t even make it to heaven or purgatory as they don’t have any real sorrow for their sins and pretend like they love God but really don’t. Our Lord in St. Faustina’s Diary instills the necessity of truly loving Him–having a hate for all sins and desiring to sin no more–and how painfully those who don’t inflict pain upon him “These [lukewarm] souls cause Me more suffering than any others.” In Revelation 3:15-16 says, “Because you are lukewarm, neither hot nor cold, I will spit you out of my mouth.” We need to save souls. Are the people looking for purification (perfection) for a glorious, blissful ETERNITY in heaven? This must be the MAIN goal in one’s life. Let’s bring the faithful to heaven with the powerful help of the priest. Read the book Dignity and Duties of the Priest by St. Alphonsus and The Book of Pastoral Rule by St. Gregory the Great, to bring further quality incite to the incredible role of the confessor for the salvation of souls. Through the sacrament of holy orders, absolutely all priests have been given the gift of providing spiritual guidance in the confessional, although some priests haven’t yet developed their potential to use the Holy Spirit’s guidance to help deliver encouraging salvific words to the penitents. To assist priests in finding their hidden potential we have provided some inspiration, as well as techniques that can easily be applied during confession. 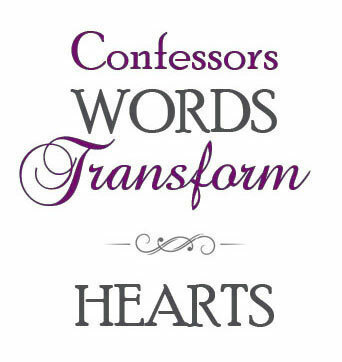 Click on the list below to find words of empowerment, which will help confessors inspire the actions of each penitent through their transforming words of mercy and truth. May no soul leave the confessional uninspired to change his ways. God wishes to reach each and every person through His magnificent priest. God’s rewards for your loving service to Him will be GREAT in heaven. Pray before each soul enters into the confessional. “Holy Spirit speak through me; guide the penitent to salvation.” We believe in the power of prayer, now, lets not forget to use it. With a line of people waiting, a confessor cannot guide the penitent on how to avoid all the sins they’ve just confessed, and the penitent wouldn’t be able to remember all the advice anyway, nor could most successfully apply multiple suggestions into their life at once. Therefore, only give advice on one or two sins—possibly three, if you think the penitent could deal with that many. Try to say as few words as possible with your guidance, then ask the penitent to repeat what you’ve asked of them. This practice isn’t widespread but is a very effective way to help the penitent remember what was advised after they leave the confessional. Believe it or not, once they walk out the door countless people almost instantly forget what the priest has said to them in the confessional. This practice helps alleviate that problem. St. Alphonsus recommends confessors counsel the penitent to do the exact opposite of their sin. For example, if a man has a violent temper suggest acts of kindness—with exact, rather than vague instructions such as “Be kind to others,” as he might say in response that he is kind. Base it on something specific; if he exploded at his son for doing poorly at school, advise him to pray and practice words of encouragement to use if his son happens to do poorly again. This way he can be prepared to respond with love and kindness. If immorality is the problem, suggest they keep themselves busy with wholesome activities and remove things from their lives that tempt them. Always remind each penitent—no matter what the sin—that praying for help is the most valuable piece of advice you have for them. Then address specific activities they should avoid, and recommend others to do instead. If they confess laziness, instruct them to become involved in charity or volunteer work, and suggest a specific charity as most people won’t know where to direct their efforts. All simple, yet effective. If the penitent needs more time to discuss how to best avoid certain sins—as is the case sometimes—then schedule an appointment outside of the confessional since the confession is only meant for brief guidance; long discussions are designed more for spiritual direction. The penitent should never leave confession with unanswered questions, a feeling that they don’t fully understand God’s mercy, or confusion over how to avoid the sins they’re committing. The penitent should feel loved and cared for by the priest, and the priest’s willingness to make additional time for them will show them the priest really cares about their soul. God will never give the priest more work than His loving servant’s heart can handle. A patient, loving, understanding confessor is every penitent’s dream. A non-judgmental priest, who asks questions instead of assuming—or in other words, judging—brings proper discernment of God’s will to the penitent, and is a confessor who God can speak through. When someone enters the confessional and the priest is loving and patient towards them and explains God’s mercy, yet is serious about the consequences of sin and the need for change, and he has a relaxed, joyful demeanor, yet never jokes about or makes light of their sins, then he is a priest that can truly inspire a soul to grow in holiness. 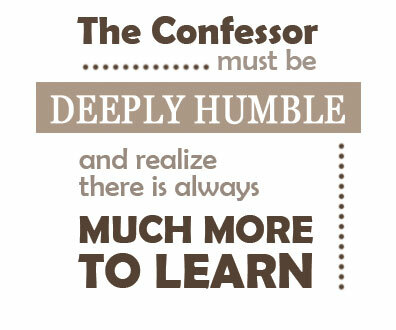 Everyone, from the most worldly to the very devout, deserves kindness and deep respect during confession. When God witnesses a priest doing all he can to save the souls of His children, it is a great delight to Our Lord and surely many blessings will be bestowed into his soul. The confessor is obligated to always guide the penitent away from possible mortal sin, and explain the consequences of those sins along with the amazing grace and forgiveness God gives to everyone who repents/changes. Sadly, many don’t realize that if a person dies with unrepentant mortal sin on their soul, they are deserving of eternal anguish in hell. Everyone who comes into the confessional dead from their sins must be made aware of this truth. These words can be a wake-up call, driving them to take action against falling into those sins again. They need to understand the gravity of mortal sin and that it not only destroys their life in the present day but for all of eternity as well. Fear of the Lord and His just punishments can encourage someone to change their ways, even before they manifest a desire to sin no more out of love for God. Therefore, boldly teaching the reality of eternal suffering is essential to transforming souls, which is, sadly, not practiced often enough in today’s teachings. RESIST DOWNGRADING SIN – Since the confessor is called to save souls with the truth, because “the truth will make them free” (John 8:32), it is vital the confessor doesn’t fall into Satan’s trap of placating the penitent, telling them their sin is really no big deal, or not even a sin at all. “Your iniquities have been barriers between you and your God, and your sins have hidden his face from you so that he does not hear” (Isaiah 59:2). It is true sometimes—however rare—that a penitent “creates” sins when none are present. Yet, most of the time it is the priest’s lack of understanding of the sin (or its underlying factors) that makes him think no sin was actually committed. Therefore, it’s best to inquire further before suggesting to the penitent that they “didn’t sin.” If someone leaves the confessional not having a desire to change their sinful nature, or sees their offenses against God as nothing worth changing, then their soul will continue to suffer from those offenses, which will set them onto a path of destruction. The sheep must know if they don’t stop committing their mortal sins and they die (unless they receive reconciliation immediately before death and haven’t had the opportunity to sin mortally again, and they possess actual sorrow (perfect or imperfect contrition) they don’t have sanctifying grace on their soul and salvation will be lost for eternity. This is why the saints say, “We shall find out at the day of judgment that the greater number of Christians [Catholics] who are lost were damned because they did not know their own religion” (St. John Marie Vianney). THE TRUTH BRINGS REAL COMFORT – A soul isn’t saved if the person doesn’t change their grievously sinful ways and enter into a state of sanctifying grace. There’s a temptation to placate the penitent so they leave the confession “feeling good” since the truth might be a little hard to accept sometimes. Satan’s comfortable stance of “Oh, don’t worry about it, God forgives you” confuses many. It’s true that God forgives you—if you are truly sorry, but that sorrow must be present. But equally as important, is the fact that all of our sins – whether mortal or venial — hurt our relationship with God who we should love. We should never forget God’s incredible mercy, since without it we would be dead in our sins for all of eternity. Our responsibility to work hard to sin no more should be forefront in our lives (priorities) so that joy-filled life everyone wants can be theirs. They should strive to be perfect as our heavenly Father is perfect. These are the words of everlasting life. We must do more. “The number of the elect [saved] is so small – so small – that, were we to know how small it is, we would faint away with grief: one here and there, scattered up and down the world!” (St. Louis Marie de Montfort). LOOK FOR OPPORTUNITIES TO ENLIGHTEN – For instance, if in the confessional a female mentions having a boyfriend, the priest can use this as a perfect opportunity to potentially save her soul by enlightening her to the devastating consequences of fornication. Of course it needs to be brought up gently, as to not accuse her of a sin she may not have even committed. The confessor could say, “You mentioned a boyfriend, and I know society has a different outlook on relationships than Jesus does, so I just wanted to let you know—since I wish for you to live a wonderful life, free from sin—that God tells us that having sexual relationships outside of marriage is a grave sin. He told us this because He loves us, and following his design for men and women is the way to true happiness. I just wanted you to know this since so many people are suffering greatly because of this mortal sin, and I didn’t want you to suffer too.” It doesn’t matter if she isn’t committing fornication, educating her about the commands of God will not only help her in the present, but also with her choices in the future. Countless people wonder why their relationships and lives are so horrible; it’s because of the sinful choices they make. It could be that, sadly, nobody cared enough about them to tell them the truth. Everyone needs guidance, and God wants us to spread His love and truth, because His people need the truth. THE TRUTH WILL HELP RESTORE THEIR SIGHT – So many of the wonderful children God created are incredibly blind due to their sins; they don’t even realize that sexual immorality is ruining their lives. Some know very well that they’re behavior is wrong, but they try to justify their choices to avoid feeling guilt by saying “Hey, everyone else is doing it.” They need to understand that just because everyone else is doing it, doesn’t make it any less of a sin. EDUCATE WITH THE TRUTH – Guiding the people to their call to holiness, through obeying God’s commands, which should be our great desire, is one of the magnificent works of a priest. Sadly, many people have chosen to live life as the wish, and they and others are suffering because of it. Therefore we must do more. The people have simply forgotten why they should obey God. Through His infinite goodness Our Lord gave us these rules, not to enslave us, but to set us free from the enslavement of sin. He wants us to live good, holy lives and share eternity with Him in Heaven. People either don’t know or have simply forgotten that when we choose to live God’s commands, our lives will change and God will bless us with His gifts, both now and forever. We can counsel people with depression, but until they’re willing to change—in other words, stop sinning—the depression may very well remain. If people only knew just how much healing takes place through Jesus’ mercy, forgiveness, and salvation in the sacrament of reconciliation; they would fly to the sacrament. Sometimes a person enters the confessional riddled with guilt over their sins. After you reassure them of God’s abundant love, mercy, and perfect forgiveness to the contrite heart, it’s best to still mention the seriousness of their sins, even if they are very sorrowful. Many times the penitent hopes the priest will tell them their sin really isn’t a sin, and that no matter what you do God forgives you, so they can feel free to continue on in their sin, guilt-free. But what they need is for the priest to tell them—in no uncertain terms—that they must do all they can to avoid committing those sins again, so they can be free to live a life of true joy not as a slave to their sin. The priest needs to show love and compassion to the guilt-ridden penitent by instructing them not only about the truth of God’s mercy, but also about the consequences of sin. If the sinner’s still overwhelmed with guilt, you should remind them the angels in heaven have just rejoiced over the penitent confessing their sins with true sorrow and the desire to change. If you let them know God doesn’t look at them through their sin, but sees them as His beautiful creation and looks at them and their potential to be holy. He sees them through His unconditional love for them and that should bring great peace to the person’s heart. You could tell them God created them for a specific reason, and they need to work daily to eliminate their sins so they can discern God’s will in their life and live it. You might also mention that to live in accordance of God’s will for them will bring them great joy, peace and fulfillment, and an eternity in heaven with our Lord which is God’s greatest desire for them. Also, encourage them that praying every day at the three o’clock, for God’s Divine Mercy to pour into their soul, will send amazing grace into their lives. Reminding them, right then and there, to set an alarm will make all the difference to the prayers being prayed or not. Prayer is vital for bringing about change in the lives of God’s children. Avoid telling the penitent that what they did was wrong or bad or “you shouldn’t have done that”. If the soul is sensitive to their sin and full of sadness over offending their God already, that simply twists the knife they already feel in their heart. They know their guilt, that is why they confessed the sin. The penitent is looking for guidance away from sin, not restating what they have already said which hurts them and doesn’t provide guidance they need. Those, on the other hand, who recognize that they are weak and sinful entrust themselves to God and obtain from him grace and forgiveness. It is precisely this message that must be transmitted: what counts most is to make people understand that in the Sacrament of Reconciliation, whatever the sin committed, if it is humbly recognized and the person involved turns with trust to the priest-confessor, he or she never fails to experience the soothing joy of God’s forgiveness. How hard it is for the confessor to not make rash judgements! Confessors unknowingly make rash judgements often. “Don’t be so hard on yourself…realize God loves you.”, the kind priest says to the penitent hoping to cheer her up us as she cries through her confession. Little does the priest know, she’s not crying because she’s depressed nor because she doesn’t fully understand God’s love and mercy, she’s crying out of a great contempt for her sins which she is blessed to be able to feel. She cries because she truly detests her sins and can’t bear hurting our Lord, and it is the incredible love and joys from forgiveness of God that brings her to tears. Instead of the confessor speaking to bring her comfort, it would have been wise for him to ask, “Why are you crying?” before offering any words. The confessor can ask “why” for every question or concern. Now he knows…no guessing, assuming or judging is needed (unless of course the penitent doesn’t even know why they are doing something…which is the case some of the times). It is wise to NEVER ASSUME ANYTHING. If the priest has almost no information, how can good judgements be made? There’s always a reason why everyone does everything they do, and that “why” can open up their eyes to other sins they aren’t even aware of to help motivate change. Many confessors make the mistake of assuming they know why the penitent did something; this wrongful thinking can lead people to frustration and dissatisfaction with confession, as it doesn’t give them the help they need to gain deeper insight so change can begin. 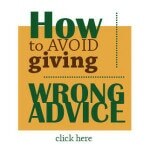 Therefore, it’s best to never assume, and always ask why before providing any advice. There are many who say they don’t want to sin but don’t have the will and determination to do so. They pray, but recommit the same sins over and over again from a lack of motivation to stop scourging their Lord. They don’t spend the time to look into the reasoning as to why they sin and come up with a plan to remove the temptation or behave correctly if the event were to come about again and from a lack of real determination (hate for their sin), they fall right back into the sin over and over again. You can give the people guidance on how to develop a real hate for sin and a true plan that will help them over come the sins that are pushing away God’s grace and keeping them from the life of happiness and the relationship they should be experiencing with God. Prayer– Encourage prayer since God can cure all ills, therefore if we have a problem with something that we’d like to rid ourselves of, such as sin, depression, anger, etc., we must first put all of our trust in Jesus, and envoke the power of prayer to solve all of our problems. Plan– Come up with an exact plan for avoiding sin. For example, if immoral thoughts is the sin you’re guiding the penitent away from, you need to first find out where those immoral thoughts are coming from—they could come from TV, magazines, the internet, etc. If it’s the TV, remove the channels which play immoral shows. If magazines are the culprit, don’t buy those magazines. If the problem stems from the internet, purchase an internet blocker to block improper shows. Perform– Then after you have given them a plan to remove the temptations, you need instill the need to actually perform them. Performing the plan proves, through their actions, that they are truly sorry for their sins. Calling the TV provider to block the immoral shows; praying for self-control to not purchase anymore inappropriate material; actually spending the time to put the internet blocker on the computer are how we prove our sorrow, because putting forth the effort to perform the plan, with prayer, to avoid sin proves that someone is willing to take the steps necessary to stop offending God and walk on the path to holiness. After delivering the truth, the seriousness of sin and how to avoid sin, always end with love. I’m not saying the truth isn’t loving, as that’s the kind of love that transforms, but most people don’t perceive it that way. So you might want to tell the penitent about the grace and forgiveness they’ve received through the sacrament. Two Hail Mary’s and an Our Father are wonderful prayers, but they don’t stir many penitents into a deeper love for God and a loathing of their sins and a willingness to make right their wrongs. In fact, after confession most people quickly rattle through those prayers—which really isn’t praying at all—and they don’t end up benefiting from them. The same goes for telling a penitent to perform a work of charity. They mostly simply say to themselves, “That is all my life is…I’m always giving of myself.” That penance simply wasn’t specific enough to stir them into truly giving outside of their ordinary life. As if it isn’t challenging enough to say something meaningful during confession, you now need to come up with an equally meaningful penance. Yes, being a confessor is hard work, but it’s a very small sacrifice when you consider the magnitude of the results that come from the sacrament of reconciliation. Ask them to write down two resolutions they can make to avoid their sins—you may need to provide an example. Have them write two ways they can be—for instance—more patient, loving, truthful, etc. Tell them to write down ten qualities about themselves they are grateful for. Encourage them to look at God’s virtuesfor assistance. Have them come up with five material things God has blessed them with—and you can provide them with a list a virtues. Ask them to contemplate eternity and what God says we must do to be with Him. Have them read the gospel Luke 6:28– “love your enemies, do good to those who hate you, bless those who curse you, pray for those who mistreat you”. and find out what they can do to live that messages in their life. Instruct them to contemplate what love is and how they can love more perfectly. You can even refer to www.the3oclockchallenge.com and their description of “what is love” on their education page to help inspire the penitent to change. Read a penance for a penitent with a very strong faith that wishes to grow in great closeness with God. It used to be the prevailing practice within the confessional that the confessor would decide whether or not to bind or loose the sins of the penitent. These days, there seems to be a growing trend in which the priest absolves every sin brought before him in the confessional—regardless of whether the penitent is truly sorry for their sins or not. With the shortage of priests these days some confessors may feel the need to rush through confession to get to their other duties, but they cannot neglect the importance of making sure the penitent is truly sorry. Of course it’s a rarity when a priest is able to read souls like St. Padre Pio did; however, when a sin mentioned in the confessional, which sounds like an ongoing sin the priest has the duty to ask how they are planning on stopping their sinful ways to prove their true sorrow, and of course if the penitent doesn’t provide the desire to actually change, then absolution shouldn’t be given. True sorrow, as defined in the Catechism, is when someone hates all of their sin and desires/works hard to sin no more. These qualities must be present for someone to be forgiven of their sins by Our Lord. Today it seems rare to find priests who will take the time to look into the intentions of the penitent, using their best judgement as to whether the penitent was truly sorry and desires to change their ways and sin no more. St. Thomas of Villanova said that the confessors who are too indulgent and forgive without just cause are actually hurting the penitent, and lacking in true charity. Giving out forgiveness to everyone who enters the confessional—regardless of whether it’s apparent that the penitent is actually sorry or not—makes confession dishonest. It gives the penitent the false notion that as long as they bring it up in the confessional—whether or not they are truly sorry and planning to stop sinning—that they’re forgiven and that heavenly reward is still theirs, which simply isn’t the case. This encourages the penitent to keep on sinning the sins they just confessed because they think they can just go to confession and be forgiven whenever the mood strikes them and won’t see any reason to actually change their life and strive to sin no more. Therefore, these poor souls aren’t lead away from sin and freed from it, but become even more tightly bound up in it by indulgent confessors. It’s vitally important to the salvation of souls that all confessors go back to that former “prevailing practice” and stay alert to any penitent who doesn’t seem wholeheartedly sorry for their sins. Read St. Alphonsus’ “Dignity and Duties of the Priest” for further guidance and read examples of how you can easily determine if someone possess actual sorrow. Confession can be intermingled with spiritual direction, which is ideal for spiritual growth. Since the role of a confessor/spiritual director is to guide each soul to sanctity, no matter how far from that goal they may be. The confessor will need to know the penitent’s sins in order to guide them away from those sins, since it’s their sins that are keeping them from God and sanctity. To help the penitent stay on the path that God has chosen for them, the confessor also needs to learn what God’s vocation is for the penitent—not necessarily what the penitent’s desires are—since much of the time our desires are skewed from love and service into selfish hopes and dreams. To achieve great spiritual growth, the confessor can help the penitent to see what separates their will from God’s will, and then lead them toward God and away from sin, so that ultimately the penitent’s desires will unite with God’s desires for them, in order for that will to become one in the same. All other advice is secondary to these main goals, as they are the foundation for all other facets of faith development. Priest can suffer from the same consequences of sin as the parishioners. They too can loose site of the reality of sin. Therefore, priests, who need to be able to distinguish one sin from another, so they can guide the penitent away from their specific sins properly, must constantly study moral theology and frequent confession as it is necessary to be able to properly advise the penitent away from their sins. The improper guidance of a penitent can mean eternal anguish for the penitent’s soul, as well as the confessor’s soul, since God holds the confessor responsible for all of the souls he guides. One of the most memorable and transforming words of advice I received from my confessor was: “Once you realize you’re already full of God’s love, you won’t want anything else.” That advice was given to me for my sin of seeking approval from others. It was exactly what I needed to hear. It wasn’t long or complicated but just perfect for me and something I could actually remember. I confessed many other sins but the sin of seeking approval had been haunting me for a while, and I was simply at a loss at what more I could do to eradicate it. Those were the words delivered by the Holy Spirit and it meant a great deal to me. Words driven from the Holy Spirit are possible from every priest, and will transform lives. The office of confessor, is of all offices, the most important and the most difficult. The confessor is a marvelous gift from God for the salvation of souls. Words of enlightenment which pour out of the confessor can inspire the penitent to abolish their sinful ways. Driven by the Holy Spirit, the confessor has endless potential through his words to inspire the people to change. When the confessor constantly strives to save souls, the Holy Spirit can use him to bring the words of inspiration that can transform hearts and minds. 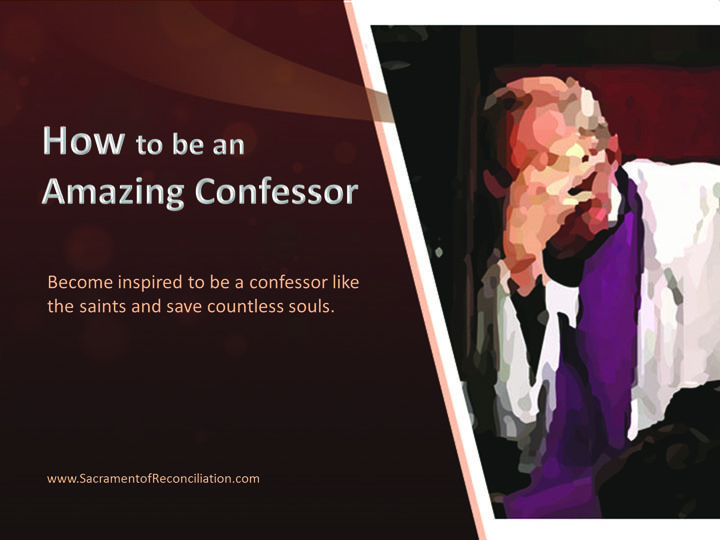 Get the 'How to be an Amazing Confessor' Brochure. The fall in church attendance, vocations, etc. is from sin. Eradicate the sin….through reconciliation…awaken the people.